A while back, long while back, I shared some hummus recipes. Well, I wanted to revisit them as I have overhauled them to my family's liking. One of them is the avocado hummus. I love making hummus, because I can make so much for less. 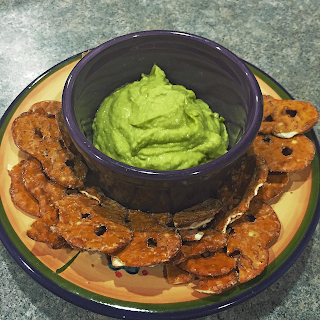 Today I made a batch of avocado hummus. It turned out super yummy! Add all ingredients in food processor and blend until smooth and creamy. Transfer to container, cover and chill and enjoy! I am really excited to be posting at The Pink Senorita today! My name is Helen and I recently met Danesa at a wedding for a mutual friend. We realized we have a lot in common and she invited me stop by periodically with some ideas and projects. Let me tell you a little bit about myself. I live in Northern California, and if you're thinking San Fransisco think 5 hours north of that (if California was the world we'd be the North Pole). I've been married for 13.5 years and I have five kids (2 girls and 3 boys). So you know that saying that goes, "not my monkey, not my circus"? Well usually it is my monkey and my circus and it keeps everyday of my life pretty interesting. Part of the deal with having so many monkies running around is that they're always drawing pictures and I don't have enough refrigerators to display all their masterpieces.